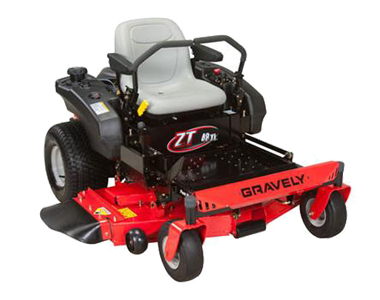 With top speeds of 6.5mph and a powerful 25 HP Kohler engine, the Gravely 54 Inch Zero Turn Mower lets you mow large areas quickly.The 54” cutting deck has 7 different cutting steps that can be adjusted by using the foot-pedal deck lift, you won’t have to leave the driver’s seat to get a perfect cut! This mower is sturdy with a low center of gravity and tubular frame built for strength and durability, which ensures that you will be able to mow for years to come. Kohler 7000 Series Pro: Powerful performance is provided by the 25 HP Kohler 7000 Series Pro engine. 54" Fabricated Cutting Deck: Efficient cut quality is provided by the 7 cutting steps ranging from 1.5-4.5 inches for the perfect cut every time. Click the button below to add the Gravely ZT XL 54 inch 25 HP (Kohler) Zero Turn mower to your wish list.